If you want to build a Web application quickly, do it with ASP.NET Web Forms. However, you have to be willing to give up a lot: client-side coding and Ajax is more awkward in Web Forms than MVC, you won’t have as complete control over your HTML/CSS as in MVC, and you’ll have to be careful about what code goes into your code-behind file if you want to do automated testing. Because those are areas that people do care about, the future of Web development in .NET belongs to ASP.NET MVC (it’s telling that there is no “MVC” in .NET Core — the Web application framework is just called “ASP.NET Core”). Don’t. There is no migration path and your Web Forms application has that whole “working” feature that users like. If it’s just a need to add client-side support or to look up-to-date, consider replacing the default Microsoft Web Form controls with controls from third-party providers. A lot of those third-party controls offer features that the default Microsoft Web Form controls don’t (rich client-side models, for example). They are also often “plug-compatible” with your current controls so you can just replace your existing Microsoft control with a third-party control and start doing cool stuff. If you must convert (because you don’t want to support two toolsets or there’s something you want your application to do that Web Forms doesn’t support or your commercial application looks old fashioned or management has mandated it or …), remember that, since Visual Studio 2012, you can combine MVC and Web Forms in the same project. Do the conversion form by form rather than creating a whole new site. There will be some forms (those forms maintaining your lookup tables, for example) that you may never bother converting. Where you need to rewrite an existing Web Form to ASP.NET MVC, remember that you wrote that form the way you did because you wrote it in Web Forms. If you’d written it in MVC, you’d have done it differently. Do it that “differently way” now. ASPHostPortal.com is the leading provider of Windows hosting and affordable ASP.NET MVC Hosting. ASPHostPortal proudly working to help grow the backbone of the Internet, the millions of individuals, families, micro-businesses, small business, and fledgling online businesses. ASPHostPortal has ability to support the latest Microsoft and ASP.NET technology, such as: WebMatrix, WebDeploy, Visual Studio 2015, .NET 5/ASP.NET 4.5.2, ASP.NET MVC 6.0/5.2, Silverlight 6 and Visual Studio Lightswitch, ASPHostPortal guarantees the highest quality product, top security, and unshakeable reliability, carefully chose high-quality servers, networking, and infrastructure equipment to ensure the utmost reliability. HostForLIFE.eu guarantees 99.9% uptime for their professional ASP.NET MVC hosting and actually implements the guarantee in practice. HostForLIFE.eu is the service are excellent and the features of the web hosting plan are even greater than many hosting. HostForLIFE.eu offer IT professionals more advanced features and the latest technology. Relibility, Stability and Performance of servers remain and TOP priority. Even basic service plans are equipped with standard service level agreements for 99.99% uptime. Advanced options raise the bar to 99.99%. HostForLIFE.eu revolutionized hosting with Plesk Control Panel, a Web-based interface that provides customers with 24×7 access to their server and site configuration tools. DiscountService.com.au is The Best and Cheap ASP.NET MVC Hosting. DiscountService.com.au was established to cater to an under served market in the hosting industry web hosting for customers who want excellent service. DiscountService.com.au guarantees the highest quality product, top security, and unshakeable reliability, carefully chose high-quality servers, networking, and infrastructure equipment to ensure the utmost reliability. DiscountService.com.au has ability to support the latest Microsoft and ASP.NET technology, such as: WebMatrix, WebDeploy, Visual Studio 2015, .NET 5/ASP.NET 4.5.2, ASP.NET MVC 6.0/5.2, Silverlight 6 and Visual Studio Lightswitch. 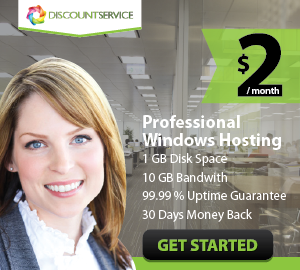 DiscountService.com.au is devoted to offering the best Windows hosting solution for you. ASP.NET Core Razor Pages vs MVC: How Do Razor Pages Fit in Your Toolbox? We are expanding on our fifth year of encouraging a data and lead era trade between ASP.NET clients/Internet Users with the item/application supplier. We distribute all pertinent articles at any rate once a week and this articles/news will be recorded on significant web crawlers and they are, no doubt creeped by major ASP.NET discussions and discourse sheets.